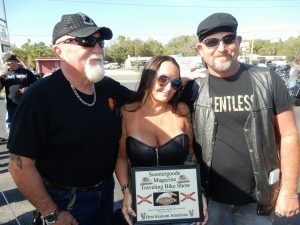 3/24 – Mickey’s 9th year Anniversary Party – Traveling Bike Show. George & his staff did a great job again throughout the day – one hell of a turnout! A unusual high number of really nice bikes in the Old Skool & Vintage classes made judging both fun & difficult. Thank you to all that participated & congratulations to all the winners. 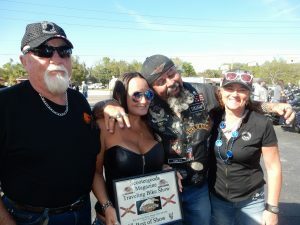 This is the way that we saw it: Best of Show – #22 Mike – 2014 HD Street Glide. 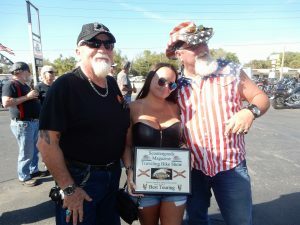 Best American – #11 Vinnie B – 2004 HD Heritage Softail. Best Kustom American – #6 Brian – 2007 HD Road King. Best Paint – #9 David – 2000 HD Heritage Springer. Best Touring – #24 Daryl – 2017 HD Ultra Glide. Best Kustom Bagger – #21 Tim – 2005 HD Heritage Springer. Best Chopper – #20 Daniel – 2015 Self Built Custom Chopper. 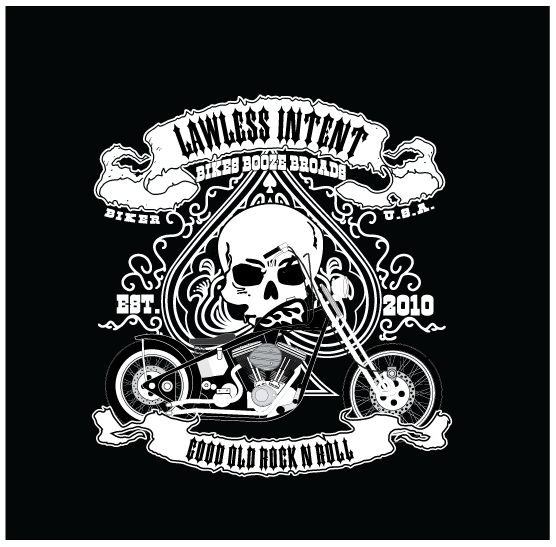 Best Old Skool – #7 Stanimal 1977 HD Shovel Head. Best Vintage #4 Mike – 1948 HD Pan Lower/Shovel Upper. Best Import – #15 Scott – 1977 750 S/S (low miles – like new). 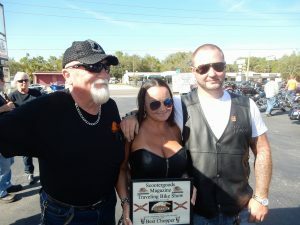 Best Lady Rider – #13 Kim – 1976 Honda 400 Auto (bobber – very well done). Best Trike – #3 Ray – 2001 HD Road King. 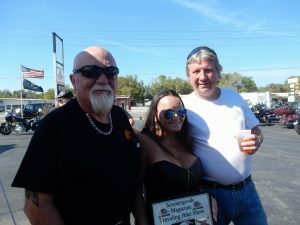 “Thank You” to Mickey’s for the 9 years of supporting the biker life style. did a great job with the food & booze, along shots & raffles. Music was provided by the Dave Adams Band. They where really quite good. The bar out back was very busy wiith folks opting to sit outside due to the awesome weather. 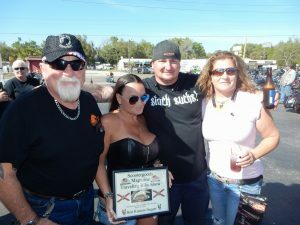 Congratulations to George and Crystal on their 9th year of serving our biker community. 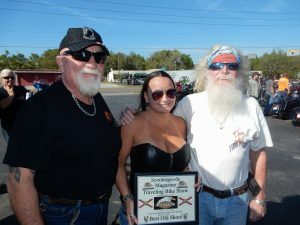 Another awesome Scootergoods Traveling Bike Show, thanks to Brother John & Milkie! !